Two United States Football League teams that were having difficulty generating offense in the early going met on March 17, 1984 in San Antonio. The visiting Los Angeles Express were off to a 1-2 start while the San Antonio Gunslingers remained winless at 0-3. The Express, under Head Coach John Hadl, had made a change at quarterback from Tom Ramsey to Frank Seurer and there was hope for the future in rookie Steve Young out of Brigham Young, who had recently signed a mammoth $40 million contract. However, Young was not yet ready to play and would not be suiting up against the Gunslingers. San Antonio, one of six expansion teams for the USFL’s second season and coached by Gil Steinke, had quarterback problems of its own. The Gunslingers were without their prize rookie, QB Rick Neuheisel, as well as backup QB Mike Ford due to injuries. 34-year-old Karl Douglas was behind center for the game against the Express. There were 9821 fans in attendance for the Saturday contest at Alamo Stadium. As could be expected, they didn’t see much scoring, especially in the first half. The Express got on the board when Frank Seurer threw to WR Ricky Ellis for a 15-yard touchdown. 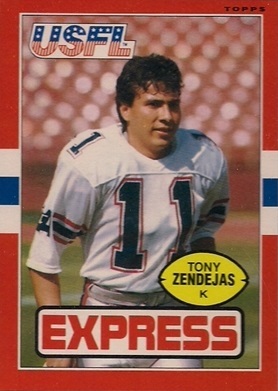 Tony Zendejas added the extra point, and that was it for the scoring in the first thirty minutes. San Antonio’s offense may have been feeble, but the defense was tough and in the third quarter LB Putt Choate intercepted a Seurer pass and returned it 45 yards for a TD. However, Nick Mike-Mayer’s extra point attempt was blocked by LB Howard Carson and the Express remained ahead by 7-6. Later in the period, a blocked punt led to points for San Antonio. DB Peter Raeford blocked the kick by Jeff Partridge and DB Maurice Tyler recovered for the Gunslingers at the LA 32 and returned it to the six yard line. At the beginning of the fourth quarter, the Gunslingers scored when RB Scott Stamper ran two yards for a TD. But once again San Antonio failed to add points after a touchdown when the pass for a two-point conversion failed. With just under nine minutes on the clock, Zendejas booted a 36-yard field goal to make it a 12-10 contest. The Express got a break as time was running down when a poor punt by San Antonio’s Ken Hartley into a stiff wind gave them good field position. Zendejas kicked another field goal, this time from 39 yards with 1:09 remaining to play to put LA ahead by a point. It was enough as the Express held on to win by a final score of 13-12. In a game in which both offenses struggled, Los Angeles led in total yards (287 to 227) and first downs (15 to 12). The Gunslingers managed only 52 net yards through the air and were penalized 10 times, at a cost of 66 yards, to 7 flags thrown on the Express. San Antonio also turned the ball over three times, to two suffered by the Express. The failure to convert, by kicking or passing, following the two touchdowns ultimately proved fatal to the Gunslingers. Frank Seurer completed 11 of 17 passes for 125 yards and a touchdown while giving up one interception. Tom Ramsey saw action and was 8-of-12 for 83 yards and also tossed an interception. RB Kevin Nelson rushed for 43 yards on 19 carries. Ricky Ellis had four catches for 32 yards and a TD and WR Malcolm Moore also had four receptions, gaining 30 yards. WR Anthony Allen led in receiving yards with 83 on his three catches. Tony Zendejas made the two key field goals in the fourth quarter that produced the win. For the Gunslingers, Scott Stamper (pictured at left) was the star on offense with 87 yards on 20 carries that included a touchdown. Karl Douglas was successful on only three of ten throws for 25 yards, giving up two interceptions, while his replacement J Torchio was three-of-nine for 52 yards and was intercepted once. WR Jerry Gordon was the top receiver with three catches for 31 yards. 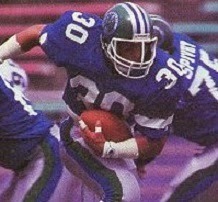 The Express lost another low-scoring game the next week, but Steve Young took over at quarterback two weeks later, and the results were beneficial. Los Angeles topped the Pacific Division with a 10-8 record and reached the Western Conference title game. As for the Gunslingers, Rick Neuheisel was back in action the following week and they won for the first time. The pattern of weak offense offsetting a solid defense continued as they went on to finish third in the Central Division at 7-11.